Last season, prints were the major menswear talking point. From high street to high fashion, everyone had print in some form or another in their collection. This explosion was unusual within the world of menswear, as it often takes a season or two for a trend to trickle down from catwalk to sidewalk. Notwithstanding tradition, prints of all calibres wasted little time in cementing themselves in our closets and personal style. Today’s focus is on taking those printed shirts, which were last season’s big selling point, and making them all time wearable for the months ahead. Olive is shaping up to be a key colour of the season. Jumping on it in the form of a printed shirt is a great way to incorporate two on-point elements in one. Black cords bring a tactile element to the outfit while the worker boots and denim jacket add a grounded aesthetic with a raw, masculine edge. If the weather is veering on deep winter rather than early fall, incorporate a cable knit jumper or scarf to bolster your layers and ensure warmth. You could also look to individualise the outfit further by tucking the trousers into some boot socks and have them peeking out above the boot. When married with a suit, a printed shirt is a great way to stand out in a smart-casual setting; especially when you throw in a successful autumn/winter sock and loafer combination. Up the temperature with a cardigan matched to the colour of your socks and complemented to the shirt. In this case burgundy (another big colour for the season) is perfect, as it a great stand-alone tone but works exceptionally well with the navy in the shirt and the backdrop of the grey suit. 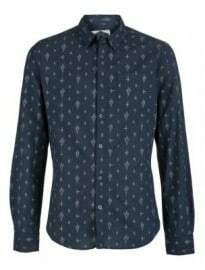 As well as being a potent smart-casual weapon, the printed shirt is also a great off-duty statement piece. The tribal trend has been prevalent for a few seasons and, as ever, a bold colour works well with slim fitting washed jeans. Finish off with a pair of minimal leather trainers and add a gilet for an extra layer. A favoured print of late, polka dots add just enough whimsy without being ridiculous. Paired with the timeless combination of a camel trench coat and navy chinos, the shirt is allowed to stand out but is subdued enough to be worn with easy confidence. Taupe boots pair well with the navy and are a good height if one wanted to add a few turn ups to show a glimpse of sock. 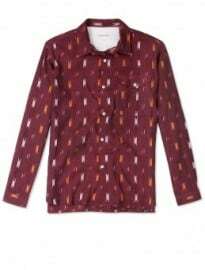 An all over monochrome printed shirt contrasted against a deep oxblood biker jacket creates a great top half that expresses individuality while remaining almost effortlessly cool. 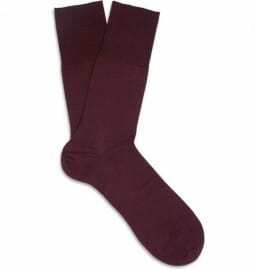 Black cotton trousers support the oxblood well, anchoring the rich burgundy and letting it stand out. The grey suede brogues offer something a little different and add a slightly refined edge to the ensemble; black Chelsea boots would also be a great alternative. These are the best collection of men fashion apparel with the quality, I love all the shirts which you selected and I also like to wear these types of casual shirts. 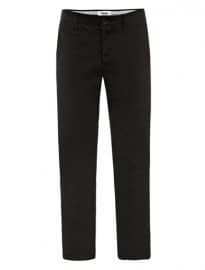 You can check the super collection of top quality of Men's Trendy Clothing at your budget price. These all are very nice looking shirt. In these shirts custom button pins can be used to give these shirt more brighter and fashionable look.